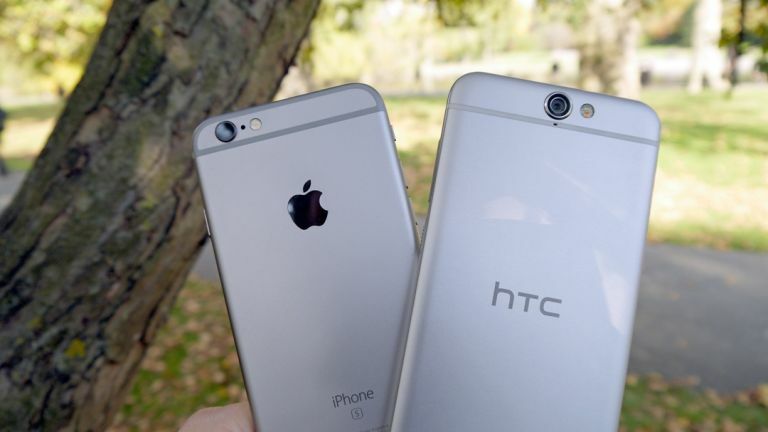 The HTC One A9 looks like the iPhone 6S, but is it as good? The HTC One was a phone which people spoke of in the same breath as the iPhone. With the HTC One M8 and One M9 the company continued to pump out stunningly stylish phones, which only Apple could really compete with. Yet while HTC's phones were every bit as premium as Apple's offerings they were also distinct and different. Not so with the new HTC One A9, which has seemingly taken more than a little inspiration from the iPhone 6S. But is it just a pale imitation or is it a great phone in its own right? We put the two through a T3 Smackdown to find out. We'd wager there'll be more than a few people mistaking the HTC One A9 for an Apple phone, what with its slim 7.26mm thick all-metal shell, rounded corners and antenna lines running across the back. All of that could describe the iPhone 6S too, other than the thickness, which isn't far off at 7.1mm thick. The two phones also both have sizeable bezels above and below the screen, with the lower one housing a fingerprint scanner. So yes, the HTC One A9 looks similar to the iPhone 6S, though the camera is in a different position and the fingerprint scanner is a different shape. But if it wasn't for that and the HTC logo on the back it really would be hard to tell the two apart. Still, if HTC is going to take inspiration from anywhere the iPhone 6S is the phone to choose. It really is gorgeous and the One A9 looks almost as good. With a 5.0-inch 1080 x 1920 AMOLED display, a fingerprint scanner, a 13MP camera, a 2150 mAh battery, fast charging and high-resolution audio support the HTC One A9 doesn't feel lacking in features, especially as it's a phone that's not quite positioned as a flagship. The iPhone 6S may have it beat though. Its screen is smaller and lower resolution at 4.7 inches and 750 x 1334, but it uses 3D Touch technology to respond to different levels of pressure, opening up new ways to interact with the phone, so it's smarter than the A9's screen. The iPhone 6S also has a fingerprint scanner of its own and a highly capable 12MP camera. There's no fast charging though, it has a smaller 1715 mAh battery and its 5MP front-facing camera could have its work cut out to top the front-facing UltraPixel snapper on the HTC One A9, which has bigger pixels to let more light in, so you always look your best in shots. Plus while the HTC One A9 only has 16GB of built in storage, which is a lot less than the up to 128GB you can get in the top-end iPhone 6S, it has a microSD card slot to further expand that by up to 2TB, which is something Apple's phone lacks. The HTC One A9 has an octa-core Snapdragon 617 processor and 2GB of RAM. That's a lot of cores but it's a mid-range chip, with four cores running at 1.5GHz and the remainder running at 1.2GHz. The iPhone 6S has just a dual-core processor, but it's a 1.84GHz Apple A9 one and coupled with 2GB of RAM it delivers seriously slick performance, which the HTC One A9 is unlikely to be able to match. With a lower price tag though it doesn't have to and it should still be a pretty powerful phone. Android Marshmallow comes baked into the HTC One A9. That's the latest version of Google's mobile OS and it's quite a big selling point given that very few phones so far offer it. It's slick, intuitive and packed full of improvements, like full control over what permissions you give to apps and Now on Tap, which lets you access Google Now information relevant to whatever you're doing, listening to or messaging someone about at the push of a button. HTC's take on Android is overlaid with its own Sense interface, but that's not such a bad thing, as it's one of the more stylish manufacturer skins around. The iPhone 6S runs iOS 9, which is just as slick and if anything even more intuitive than Android, it also has access to the highest quality selection of apps and games, though Android has it beat for sheer quantity. HTC might have taken inspiration from Apple when designing the One A9, but this is more than just a copycat phone. With Android Marshmallow, fast charging and a larger, sharper screen it provides an experience all its own. The A9 is also a whole lot cheaper than the iPhone 6S, coming in at £429.99, while Apple's phone starts at £539. But Apple goes some way towards justifying the extra, with its potentially game-changing 3D Touch technology and impeccably slick performance. For most people though the choice is likely to come down to the operating system, as while both iOS and Android are polished to within an inch of their lives at this point, they're also different and if you're already tied into one ecosystem neither of these phones is likely to do enough to tempt you to jump ship. Want to see how the iPhone 6S compares to other Android heavyweights? We've got you covered.